We produce in less than 72 hours any Master Key System, in the market brand that you choose, from small maste key systems with teeth key to big works in copy protected key and with the highest degrees in security certificates. With more than 20 years of experience and more than 2,500 master key systems done, master key system in Alicante is synonymous of Juanjo Cerrajeros. From a small office, to the most complex company, including villas, condominiums, hotels, public institutions, and so on. Juanjo Cerrajeros has the solution that best suits to your needs. From teeth key locks for installations that requires less security up to antibumping, anti-drill and anti-extraction cylinders with copy protected key, we have solutions for all security levels. Contact our experts about work done references and the solutions that best match with your needs. A master key system is essentially an access control of either mechanical or electronic or mixed systems that allows us to discriminate with a single key which users have permissions to access certain zones. From the simplest installation in a house door that allows or not to access to the clining girl up to complex accesses with hundreds of doors. We are technical service of the largest national and international brands, which allows us to adjust our services to your requirements of security and budget at all times. Mechanical Master Key System. 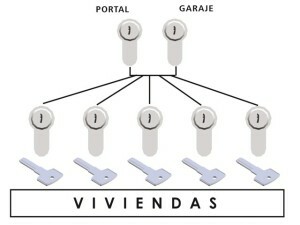 All the cylinders are mechanical and are allowed to enter or not at all times to the dependencies that the user choose. Electronic Master Key System. It allows users to log in and out, to cancel keys, to create timed access, to control which users have access to the facilities, recording hours and dates, being able to be used as a control clock and even as a surveillance round control and a long list of possibilities. Mixed Master Key System. Combination of both solutions mixing versatility, economy and safety.